For most small business owners on Instagram, creating and launching effective Instagram Story Ads still seem overwhelming and out of reach. How to shoot the Ad? How do you launch the Ad? How much money should you spend? How do you know if it’s set up correctly? I had the same questions when I began my Instagram Story Ads journey too but, don’t worry, although they can be a deeply complex science, there are also ways for anyone to create them quickly, simply, cheaply and effectively. In my case, after being shown the ropes by the always-sharp Finn Thormeier, I was able to reach over 4.3 million people on Instagram, grow over 4K followers, increased my website traffic by 100% (year to year), and earn over $450 extra dollars in sales with a budget of only $462 in a month. Once you have a differentiated account with sticky content and you’ve created an Instagram story Ad that doesn’t feel like an “Ad”, you can finally launch and measure if it works. I’ve learned from experience that unless you’re an experienced Facebook Ads manager, it’s very unlikely that you’ll get positive returns from an Instagram Story Ad if you choose to target a specific, niche Custom Audience based on demographics. That’s because effectively reaching your target audience requires a much, much deeper knowledge of audience targeting and the Facebook Ads tool specifically. So unless you’re willing to put in the time and money required to learn that skill proficiently, you’re much more likely to see positive results from your Story Ad by focusing on your widest applicable audience. Long story short, the Instagram Ads Custom Audience targeting works through supply and demand. Niche, demographics-based audiences tend to be limited but have a large demand, which increases the price of serving Ads to them. By focusing on the widest applicable audience and choosing to be charged by link click (more on that later) you are focusing on a Custom Audience segment that has a comparably lower demand and this allows you to reach a much larger number of people at a lower price. By being charged by link click, you’re only paying for the people out of that large audience who connect with your Ad and the cost per link click tends to be much lower. If you don’t believe me, run two Ad sets (one with a niche, demographics-based custom audience and one with the widest applicable custom audience) and measure which one has the lowest cost per click as well as the larger amount of follower growth and sales. First, make sure you’re set up as a Business Instagram account. 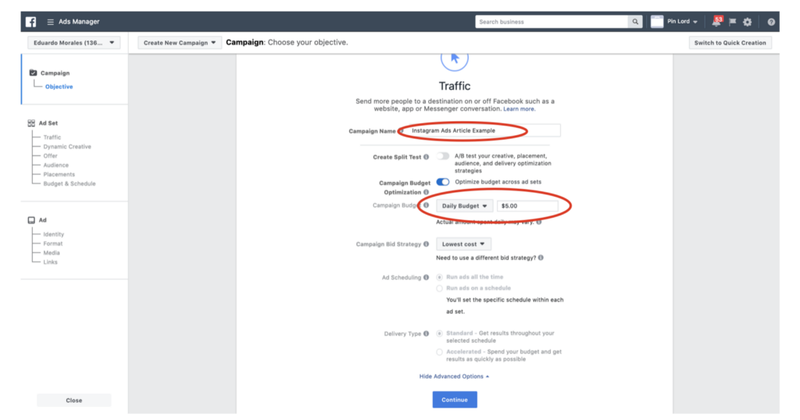 Once you’ve gone through that process, go to your Ads manager dashboard in your Business Manager profile on Facebook and click on the “Create” button to begin the set-up process. Scroll down name your campaign and input the lowest possible Daily Budget (currently, that’s $5 per day) and hit Continue. Now that you’re in the Ad Set page, select the “Website” option (this is usually default) in the Traffic box and then scroll down to the Audience box. Here’s where you select your widest applicable audience. There will likely be one already selected for you (in my case it’s United States since I live there) but just “x” out of that one and search for the largest region that’s applicable for you. In @pinlord’s case, I ship internationally, so my largest applicable audience is “Worldwide”. If you ship internationally or have a widely-available digital product, this is likely to be the widest audience option for you. Some other options are “North America”, “Europe”, “Asia”, etc. What you’re going for are regions larger than countries. Whichever one is best for you will really depend on your business. Once you have your audience area down, select the broadest age and gender applicable demographics. In my case, it’s 18–65 without gender specifics (I’m lucky that pins are usually bought by all genders). Now that you’re done with your audience, scroll down to find the “Edit Placements” section. Here, un-tick all boxes and only leave the Instagram Stories boxed marked. This will make sure your Ad is only served as a story (this will greatly lower the cost and effectiveness of your Ad since you’ve made it specifically as a story). Once you’ve edited the placements, scroll down to the Budget & Schedule box. Here, schedule your Ad for a 15-day timeline (Ads usually start seeing their steepest decline in return after 15 days) and then change the “When You Get Charged” setting to Link Click (CPC). Scroll down and click Continue. You’re now in the Ad section of the process. Name your Ad at the top and then select the corresponding Facebook page and Instagram account you’ll run the Ad on. Also, select the Single Image or Video below. Now, upload your video and in the Links section, select Website. Below that in the Website Link, enter your Instagram URL. In my case, it’s https://www.instagram.com/pinlord/. You want to lead people to your Instagram instead of your website because you’ll gain more value here. If you have a differentiated, “sticky” account (this is why that part is so important), not only will people find your site through your link in bio and possibly buy, but you’ll also get a lot of new followers. This will give you thousands of more opportunities for any of these followers to buy something from you in the future in comparison to having initially led them to your website where they would land once and buy or not buy. Once you’ve done that, scroll to the bottom of this screen and click on CONFIRM. Congrats! Your Ad is now submitted for approval from Facebook and almost ready to go live. Your Ad will show up as “in review” in your Ads manager dashboard until it’s approved by Facebook. Once it’s approved, it’ll start running (or run whenever you set the date for) and you’ll see it as “active” on the dashboard. Repeat the process for the other two best, broadest and most applicable audiences. Now that you’ve run your Ad to the wides applicable audience, it’s time to repeat the exact same process. The only step that you’ll change is to target it to the 2nd and 3rd widest applicable audiences. In my case, it’s Asia and Europe. By doing this, you’ll be serving the exact same Ad to 3 different audiences. This allows you to test the performance within those audiences to know which audience best responds to your Ad and content. This information is helpful because it’ll indicate which audience you should focus your Ad spend on in the future. Note, these will all appear as running for you. I took these screenshots once these Ads had finished running. Stop running all of the other Ads, duplicate the most cost-effective one and spend your money on the most cost-effective one for 2 weeks. Now that you’ve figured out which one of the three audiences gives you the best performance after day 3, stop running the Ads of the two worst performing audiences, and transfer that budget (if you have it) to two new Ads targeted to the audience that performed the best. To do this, select the “Duplicate” option under the audience that performed best. What you’re doing here is launching the exact same Ad to a different segment of that audience’s region, which means new people will see it but you’re much more likely to get that same high performance (level of performance of an Ad tends to vary much more from region to region but not within separate audience segments within a region). Once you’ve duplicated the Ad twice, you’ll have a total of three Ads running at the same time to the same audience. It’ll look like the photo below. Note: these will all appear as “Running” for you. I took these screenshots once these Ads had finished running. Boom! Done. You’re now running Instagram Ads. Once you’ve had your Ads running for a week, measure their performance by checking how many new followers you gained (through your Instagram Insights) and how many new sales you received (through your e-commerce platform) in comparison to a week where you weren’t running Ads. To know if you should keep running the Ads, ask yourself: “Is the $105 ($5 per day x 3 Ads x 7 days) I just spent on Instagram Story Ads the cheapest way to gain the number of followers and sales I gained during the last week?” If the answer is yes, then keep running them. If the answer is no, spend your $105 in whichever marketing strategy gets you better results for that amount of money. If you believe in Instagram Story Ads and experienced enough positive results to feel like you want to get an even better return on your investment, the only way to do that is to continue testing your Ads. Try new audience targets, tweak your videos, and tweak your Instagram page! All of these elements influence how your audience responds to the Ads so the higher quality those elements are, the better your Ads will perform. And don’t worry if this all appears confusing at first, just keep at it. No one ever became an Instagram Ads genius the first time they ran Ads. Testing consistently (and failing) is the only way to learn. Thanks so much for taking the time to read this! If you enjoyed it, please give it a bunch of claps and read my other articles ❤ Not only will it help me, but it’ll help more people (like you) see this story and learn about how they can create effective Instagram Story Ads as well! How To Create An Effective Instagram Story Ad was originally published in Hacker Noon on Medium, where people are continuing the conversation by highlighting and responding to this story.